A quiet darkness had fallen on this rural town about 15 miles north of Bordeaux, but in a small, dimly lit room at one end of a modest house, the music was roaring. It poured out through a pair of tiny low-tech speakers with more volume than seemed physically possible. The composer was sitting at his desk, pointing out passages in a score that lay open in front of him. A strange, uncanny force seemed to loom behind each bar, as if the notes on the page were pinholes burning with light from a place unseen. Despite that very real struggle, Kurtág is the most important living Hungarian composer. He is not a household name – how many living composers are? – but his musical presence in the United States has been building steadily in recent years. Kurtág has been turning up with increasing frequency on local concert programs, and at Carnegie Hall in 2005, a staging of his extraordinary “Kafka Fragments” (with soprano Dawn Upshaw) proved to be the most memorable event of the season. On Nov. 19, the Berlin Philharmonic, in its keenly anticipated Symphony Hall appearance under Simon Rattle, will perform Kurtág’s “Stele” as well as music of Mahler. Kurtag’s music and personal biography are ultimately inseparable from the tragic modern history of Central Europe. After the dark years of World War II, Hungary was smothered for four decades by a Communist dictatorship. Unlike his more widely known colleague Gyorgy Ligeti, who died last year, Kurtág remained in the country and lived out the regime. During those years, in an era that called for bombastic public symphonies, he forged a lean, intensely personal style that could serve, in its modest way, as a tonic of private truth. The composer is now 81. He lives a secluded life with his wife, Marta, in southwest France, having left Hungary in 1993 to be closer to his son’s family. He is a rail of a man, with a deeply lined face, short-cropped hair, and glasses that magnify the kind, slightly sad, slightly distant expression in his eyes. He speaks English very haltingly but one senses that the hesitation would be present in any of his six languages. Even when words come fluidly, his sentences have a way of trailing off into pools of silence. He is not one for small talk and he has little patience for the games of semantic hide-and-seek that composers sometimes play when discussing their music. For Kurtág, every word counts, so when asked by a visitor in early September about the background of a particular piece, he cut straight to the heart of the matter. Kurtag was born in 1926 into a Hungarian Jewish family in Lugoj, in a region of Romania that had been ceded from Hungary after World War I. He has called Bartok his mother tongue and not surprisingly, his earliest music was haunted by the shadow of that composer, but also by the political upheavals of the era. He spent the war years largely in Romania, and moved to Budapest in 1946. Like many Central European Jews, Kurtág at first viewed the Soviets as liberators who had helped defeat the Nazi war machine. He even wrote a “Greeting Song to Stalin,” and kept faith with the Communist idea all the way until the brutal Soviet crushing of the Hungarian Revolution in 1956. That national tragedy touched off a sympathetic earthquake for Kurtág, who watched his personal and artistic certainties crumble. The composer hit bottom in 1957-58 while living in Paris, where he had ostensibly moved to study music with Olivier Messiaen and Darius Milhaud. It was a year, he once said, that “virtually split my life in two.” He entered intensive psychoanalysis with Marianne Stein, known for her work with artists, and for counseling Kurtág to return to the musical basics, like the connection between two notes. Meanwhile, he devoted himself to what can only be described as a strange self-purification regime. He ate little beyond rice, and lost nearly 45 pounds. He read Kafka’s “Metamorphosis.” He copied out scores by the master aphorist Anton Webern. He spent his days performing gymnastics in a deliberately angular style, and building a world of stick figures out of matches, dust balls, and the cigarette butts that had accumulated in his room. He compared himself to an insect. He transformed his handwriting. It was a kind of zero-hour of the soul. When the year was over, Kurtág considered remaining in the West, but he had trouble securing permission for his family to join him. What’s more, psychoanalysis was furnishing him with a new and radical sense of independence. “With Marianne Stein, I discovered that I have not to imitate, not to be in unison with my time, but to find out who I am,” he said. “I discovered that for me, it is [unimportant] where I am living.” Kurtág returned to Budapest in 1958. He was 33 years old and had already written several pieces, but he wiped the slate entirely clean. The time had come for an Opus 1. It was a string quartet, dedicated, naturally, to Stein. The piece, he said at the time, was about a cockroach seeking the light. The work’s six short movements total about 15 minutes of music, ranging from dissonant insectoid skittering, to luminous moonscapes sketched with silvery harmonics, to a final movement in which the quartet, after great struggle, reclaims the sublime purity of a single note. The piece was at first condemned as “a work against the people” but in time it was performed. The composer had in essence begun anew, and his reputation within Hungary grew quickly. In the 1960s and ’70s, he became a figure “idolized for his attitude toward the musical past, his technique, and his sincerity,” said the musicologist Andras Wilheim by phone from Budapest. Most admired of all, according to Wilheim, was Kurtág’s remarkable sense of freedom from all the stylistic trends of the day. He had absorbed music from Gregorian chant to serialism (Ligeti sent him scores), but his newly rigorous personal language had a way of transforming everything it touched. Not that composing became any easier. Kurtág survived primarily through teaching piano and chamber music at the Liszt Academy. His own music sometimes grappled explicitly with the theme of struggling to create. One vocal work, “Samuel Beckett: What Is the Word” was written for an actress rendered mute by a car accident. Through a haunting music of stutters, the piece re-creates her epic journey back to speech. In the 1970s, Kurtág grew enchanted with the Russian poetry of Rimma Dalos. He set her words in “Messages of the Late R.V. Troussova,” a work whose 1981 Paris premiere marked the real start of his international career. In 1985-86, a few years before the regime crumbled, Kurtág wrote his “Kafka Fragments” for soprano and solo violin. He considered using the text from one fragment as the title for the entire work. It appears to capture the double-sidedness of his decades in Hungary, a time of both dark isolation and, in a way, majestic self-reliance. Kurtág’s home is small and modestly appointed, full of books and furnishings that make it feel a bit like an island of Central Europe dropped into French wine country. The composer’s studio is a narrow room off of the kitchen, with little more than a writing table, a bookshelf, and an upright piano with a special soft-pedal that he keeps permanently depressed. It would be easy for Kurtág to fill his time with commissions, but the entire system, in which works are planned out years in advance and written for players he has never met, seems utterly foreign to his sensibilities. Asked about his progress on a Boston Symphony Orchestra commission, he smiled and confessed he had not even begun. More sympathetic for Kurtág are the dozens of pieces he has written in homage to friends and colleagues, or in memoriam. These short works can sometimes resurface as the kernels of much larger pieces, as with “Stele,” whose final movement is based on Kurtág’s “In Memoriam Andras Mihaly” – a piece he wrote to honor a composer and conductor who had been a cherished friend and early champion of his music. With that said, Kurtág seemed suddenly eager to play the piece at the piano. With a slow deliberate motion, he shifted from his desk to the keyboard, and began playing with uncommon subtlety. The piece opens with giant, hushed chords of immense stillness. On Kurtág’s muted piano, they sounded with a surreal cloudiness and a distant glow. As he struck each chord, he audibly released a breath. The playing continued for one minute, or possibly five. It was impossible to know. After his impromptu demonstration, the conversation drifted to Kurtág’s love of Samuel Beckett and his desire to write an opera based on Beckett’s writing. Suddenly, a warm face appeared at the entrance to the room. It was Marta Kurtág. It was time for dinner. 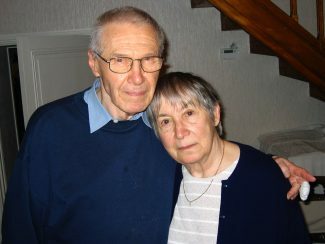 Gyorgy and Marta Kurtág have been married for six decades. Marta is a fine pianist, a bastion of grandmotherly warmth, and a gentle force who seems to soften her husband’s more austere edges. She also serves as his editor, muse, word-finder, four-hands piano partner, and, seemingly, his general interpreter of that befuddling world known as daily life. The couple’s domestic rapport is touching to observe, even before one knows anything about their history. György and Márta Kurtag. Photograph by the author. Their union came at a time of overwhelming personal loss. During the war, Marta had left Budapest to continue her piano studies in Romania. Two days after her departure, her entire family was deported. She went back to Budapest in 1946 so that her family would be able to find her upon their return. Nobody came. Over the years, Gyorgy Kurtág has written a delightful series of “Jatetok” or “Games” – short and often playful pieces that typically explore a single compositional idea. The Kurtágs perform and have recorded some of the “Games” together. But the ultimate portrait of their union is surely the final section of the “Kafka Fragments,” a magical six minutes of music, full of breathtaking night flights for violin and soprano, two lines moving with great individual freedom and yet always in some form of dialogue. The text by Kafka describes a blaze of moonlight, birds shrieking, the wind rushing through a field, and finally, a pair of snakes crawling through the dust. It is a classic Kurtágian moment, a humble image of earthly struggle, yet one that is traced with music of perfect weightlessness and, it must be said, shattering beauty. Kurtág wrote the piece in 1994 for the Berlin Philharmonic and its then-conductor Claudio Abbado. The massed orchestral forces make it atypical for Kurtag, but it is familiar in its brevity – three connected movements totaling just 12 minutes – and its fantastic power of gesture. “It has the gravity of a white dwarf [star],” remarked Rattle. The second movement is described in the score as a wild, desperate lament, with the trumpets sputtering out edgy rhythmic figures and the strings burrowing downward in long sorrowful lines. The winds and brass heckle until the textures begin to smear, the volume builds to a deafening climax. Then comes the strangest moment in the piece: a breath of silence out of which six flutes appear with a gentle, quiet music that seems drawn from another universe. The orchestra begins mustering its old attacks but the flutes have focused their collective gaze somewhere else. Sitting at his desk, looking down at the score, Kurtág grasped for words to explain this sudden congregation of otherworldly flutes. Whatever it was, it seemed to be of vital importance and personal resonance. He ultimately leaned on an image from Russian literature. This article was published in the Boston Globe on November 11, 2007.